Today in Masonic History Will Fyffe is born in 1885. Will Fyffe was a Scottish musician and entertainer. Fyffe was born on February 16th, 1885 in Dundee, Scotland. By trade his father was a ship's carpenter. His father had a passion for the theatre and ran a Penny Geggy, a traveling side show or playlet that traveled around the lowlands of Scotland. Fyffe would travel with his father and gather great experience for his future career. In his twenties, Fyffe joined Will Haggar Junior's Castle Theatre company. This led to Fyffe meeting Haggar's father, Will Haggar senior who was a pioneer silent film producer. The first film that Fyffe appeared in for the senior Haggar was an epic 50 minute version of the Welsh tale The Maid of Cefn Ydfa. The story goes that Ann Thomas, a Welsh maid was forced to marry a wealthy man named Maddocks. Before she married Maddocks she met and fell in love with a local thatcher and poet, after multiple attempts by Ann and the poet to be together, the poet left town and the Ann was forced to marry Maddocks. Ann fell ill it is believed due to her heartbreak at losing her love. On her death bed she asked that the poet come to her bedside. When he arrived she died in his arms. Some time around 1938, the film disappeared and was not found until 1984 in a family cupboard. 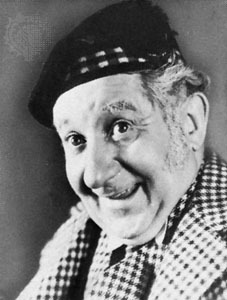 Fyffe was much in demand as an actor both in Britain and Hollywood. Fyffe would appear in a variety of films with many of the big names in film. Fyffe was more well known as an actor, he was also a great musician and comedian. He wrote many songs and had a variety of comedic characters that he would perform on stage. His most famous song, which was covered by Eartha Kitt, Danny Kaye and Kirk Douglas was I Belong to Glasgow. The song was written and recorded by Fyffe after an encounter between Fyffe and a drunk in Glasgow Central Station. Fyffe asked the man if belonged to Glasgow, the man responded that Glasgow belonged to him. Fyffe passed away on December 14th, 1947 in a tragic accident. Fyffe had recently had surgery to correct a problem with his ear. He went to his own hotel in St. Andrews to recuperate. At some point he fell from the window of his suite. He was rushed to the local cottage hospital where he later passed away. Fyffe was raised in St. John's Lodge No. 471 in Shotts, Scotland. He later joined Thalia Lodge in London, England which was mainly for "Theatricals". The lodge took it's name from the muse of comedy and pastoral poetry.